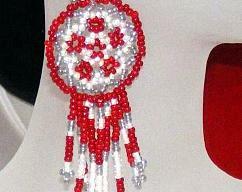 Really Round Peyote make these coin like earrings. Copper plated delica beads with Black Iris delica beads as an accent make these elegant earrings. 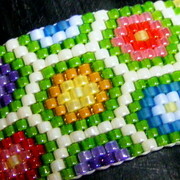 The beading pattern is Suzanne Cooper's Really Round Flat Peyote. These round earrings measure 7/8" in diameter and 1-1/2 inches from the top of the ear wire to the bottom of the circle. I have included a copper colored fish hook ear wire.